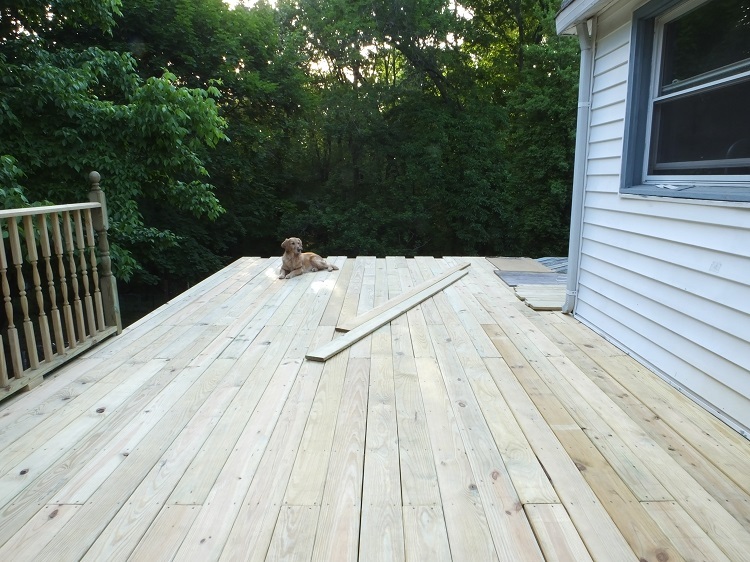 After another 12-hour day yesterday, the back section of our deck is finished. All we have left to do is build the railings (which will be sad, because we’re loving the view without them–but it must be done). We enjoyed dinner and wine here last night on the bistro set we borrowed from the front porch. It was lovely after all that work. I do have a tip if you are going to do a large project where you will be driving a lot of screws (our deck took 20 pounds of them): buy this tool for your driver. 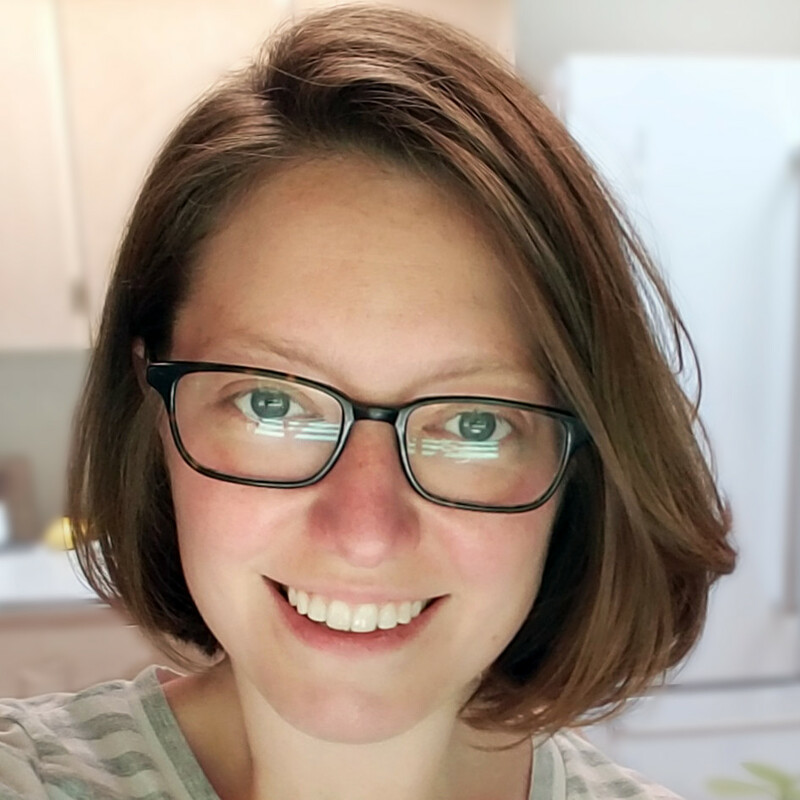 (That isn’t an ad, but it is an affiliate link, just sharing because it made a huge difference in our project.) 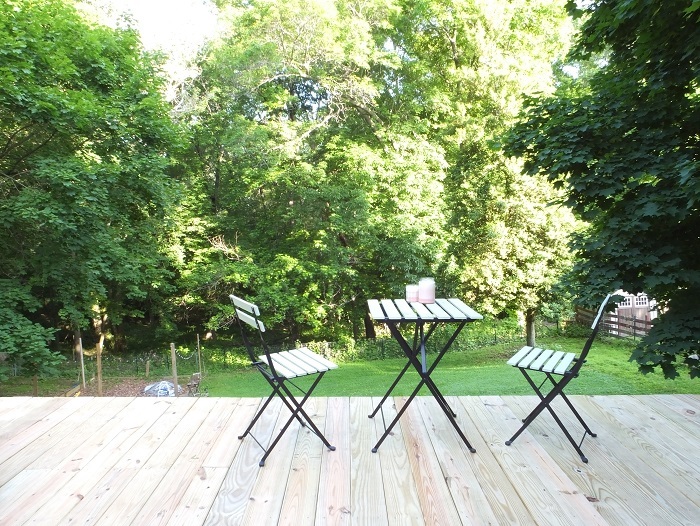 We have had it for years, but I was indifferent to it until re-building the deck. Now I love it. The black part is a tube that slides down to cover the screw. Once you put your screw in place, you slip the little cover down over it, and drill. 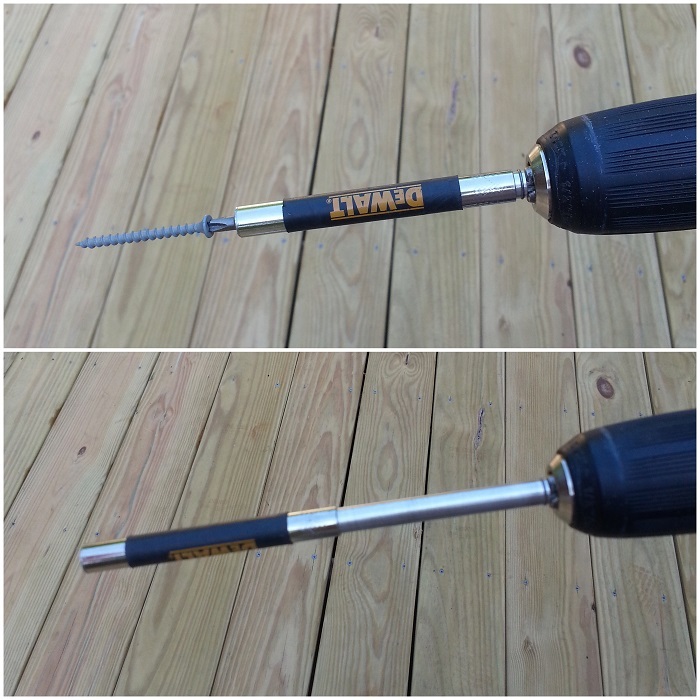 What it does is ensure that your screw goes in straight (especially helpful when using long screws) and that your driver doesn’t slip off the screw while you’re driving it and put a big gouge in your new deck boards. I may or may not have done that several times when I wasn’t using the tool. Now, if we can have a few rain-free evenings this week, we may just be able to get the whole thing finished. Then we get to the really fun part: decorating. Your arm and shoulder must have been so sore from all the drilling. But it’s really worth all your work! 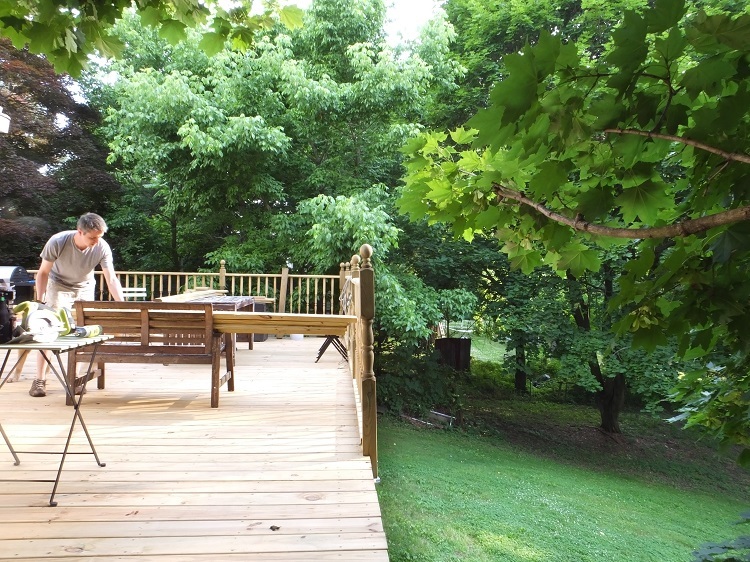 Your deck looks wonderful and the view, Wow. Without the railings the deck feels so open and somehow very valuable, like the deck is more expensive, more design that it must be. I’m not sure I can really write how it looks to me, hope you understand. But I could not live without the railings either, it must be scary on the edge without those. I’m pretty sure I do understand. 🙂 It looks (looked) pretty modern and contemporary. 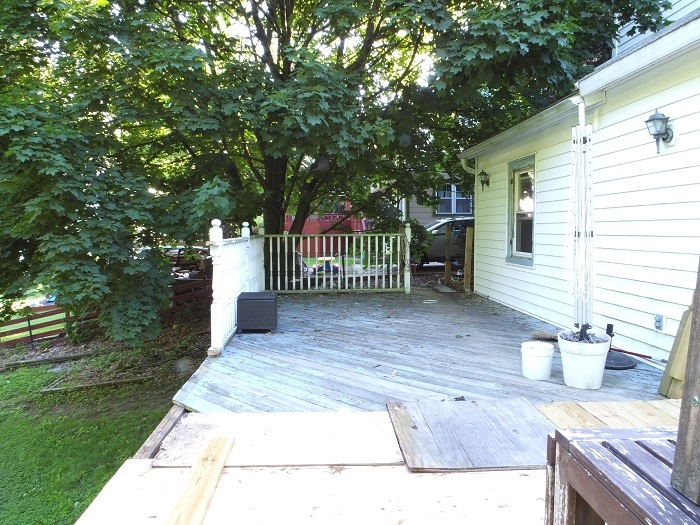 The deck isn’t quite as high off the ground as it looks, it’s only about 8 feet right there. I should give a tour of the back yard some time. Thanks for the tip on that part for the screw driver! 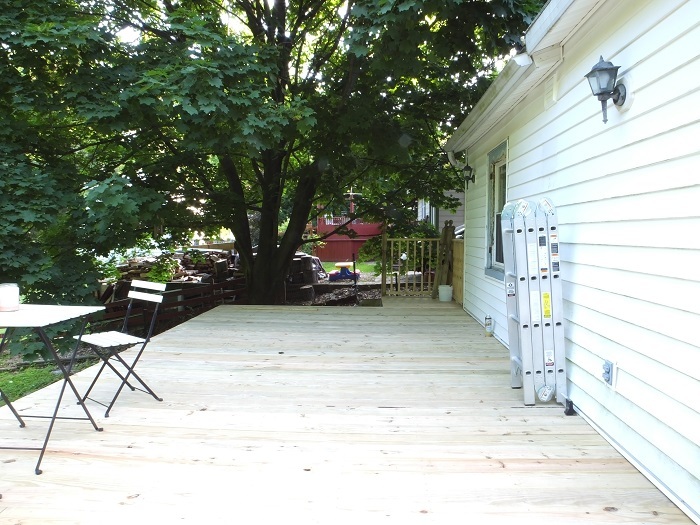 The deck looks terrific–well done! I’d love a tour of the backyard. I’m dreading the day when I need to rebuild my deck. Your’s is looking great! And yes, that bit holder comes in pretty handy, I’m a fan too. It’s good exercise, that’s for sure.